About Phillips Sign & Lighting Inc.
Phillips Sign & Lighting Inc. is a high quality design, manufacture, installation and service company providing all signage and lighting needs. Established in 1952 we place customer satisfaction as our highest value. Whether the sign or lighting system you need is large or small we concentrate on every detail, bringing every project in on time and within budget. Your total satisfaction is our primary goal. We are the premiere Metro Detroit area sign company. Whether you need pole signs, wall signs or franchise signage, we're the one to call. We can handle any sign job from design to finish. 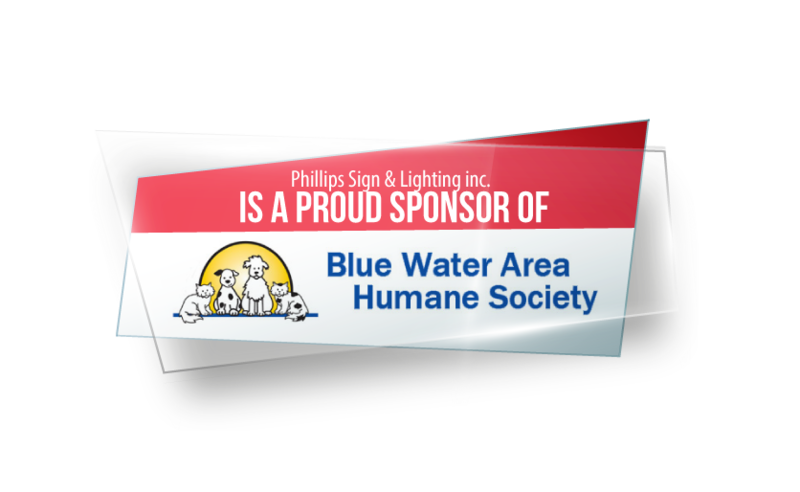 Phillips Sign & Lighting Inc. is a proud sponsor of the Blue Water Area Humane Society in Michigan. This charitable organization is dedicated to fostering companion animals. They are determined to reduce euthanasia as a means of animal population control and provide temporary safe shelter to homeless animals while they find them placement in a permanent and loving home. To find out more about this charity and ways you can help make a better future for our furry friends in the community, click on our proud sponsor badge. We're happy to share our work with them and hope you find it a noble cause. Phillips Sign and Lighting Inc. is led by professionals with over 65 years of combined experience in sign and lighting design, and installation in the Metro Detroit area of Michigan. As a Michigan sign company and committed local business, Phillips Sign and Lighting Inc. proudly serves the communities of Southeast Michigan. We are committed to total customer satisfaction and construction of the highest quality Michigan signs and lighting systems. Whether you need pole signs, channel letter signs, wall signs, neon signs, or vehicle graphics, Phillips Sign & Lighting provides unique MI custom signs for all types of businesses. Also, our commitment lives long after the sale. So, should the need ever arise, our team of experts can repair or refurbish your sign, or update your lighting system. We build lasting relationships with our clients. So, no matter what happens, we are there for you.